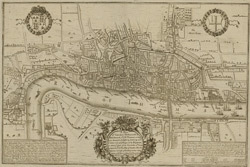 This is a derivative of Hatton's edition of Braun & Hogenberg's map-view of London. Unusually for a map of its time, most of the buildings are represented in plan instead of pictorially. The Latin text at the foot of the plate in the original are replaced by notes, in English, on the geographic and demographic growth of the city.